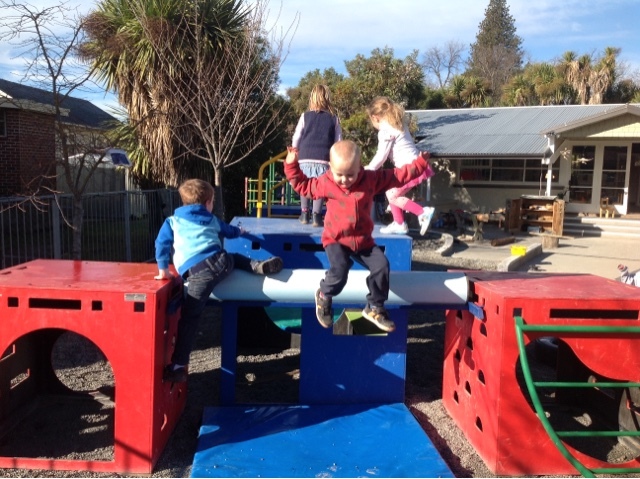 Our children have come back from their term break ready to start taking new and exciting risks here at kindergarten and today they have been doing just that. 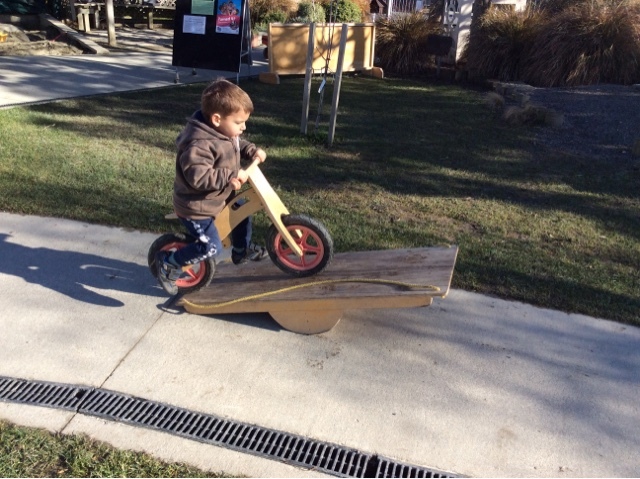 Some of the children have been challenging themselves on the bikes going slowly up one side of the ramp and carefully waiting for the ramp to tip up to ride down the other side. Others have been testing out their climbing and jumping skills, using the blue box and cylinder that have been set up differently since the start of the term. Some children have chosen to jump from the cylinder while others have jumped from the blue box, over top of the cylinder down onto the mat. Āe mārika, How about that! 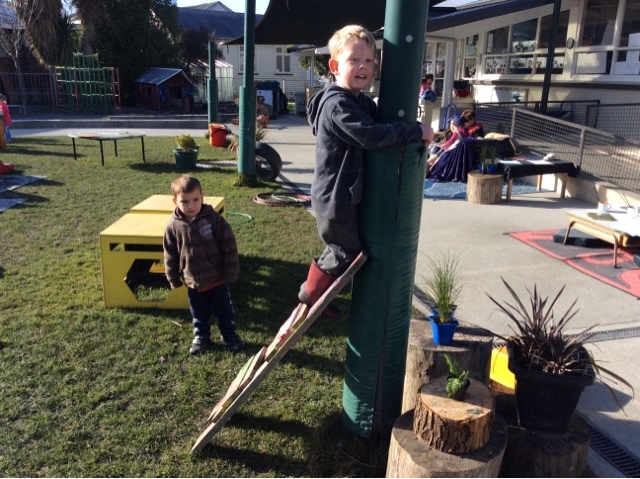 Our kindergarten built ladder has been found in some intesting places as the children take a risk to see if they can climb up and attached the bunny cords around the post. 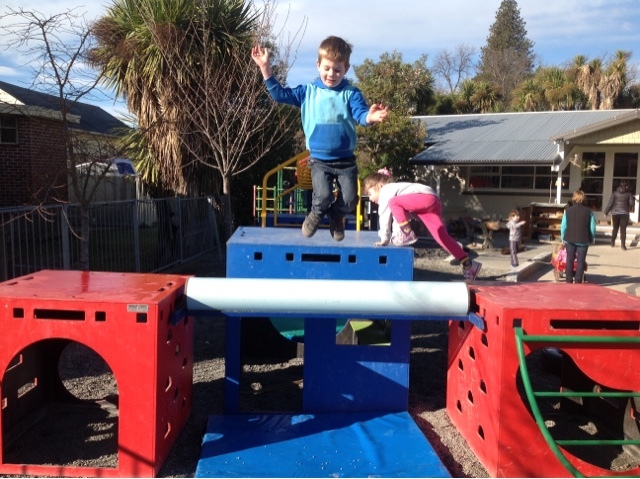 Taking responsible risks is a Habit of Mind we often encourage here at Kindergarten and our children have been using this habit in all areas of their play. Fi And Hugh Played their Ukuleles! What a lovely jam session we had with Fi and Hugh as they played a few old favourite tunes. It gave the children a chance to show off some great dance moves they have. Beau, James and Elliot all led from the front! 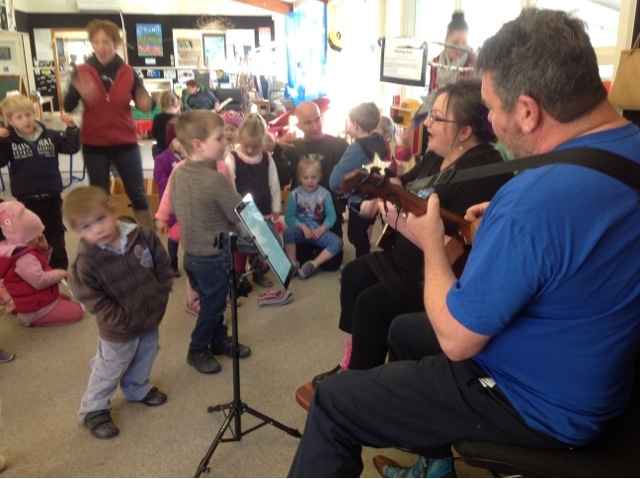 It was perfect timing to have the ukeleles playing with the annual festival on this weekend and we will be able to hear them playing as we walk the Night Trail tomorrow night! 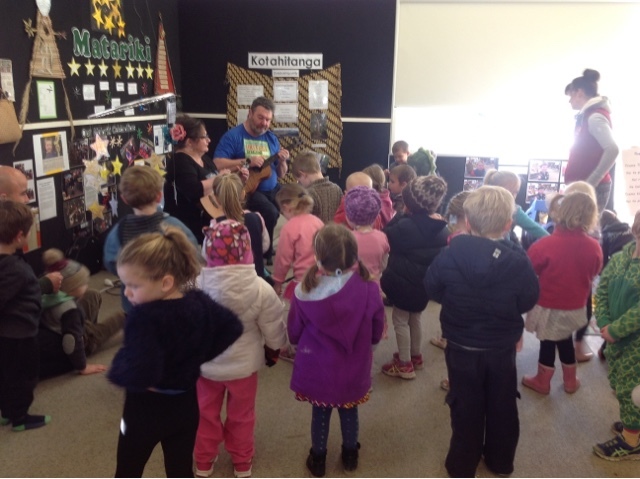 It is fantastic time for our Kindergarten to be so involved with the community as a whole. Kai pai mo to mahi to everyone participating with us on the Light the Night Trail! Sandra arrived today saying, "I've got the sewing machine!" The children were instantly curious to find out what Sandra was going to do with her sewing machine. 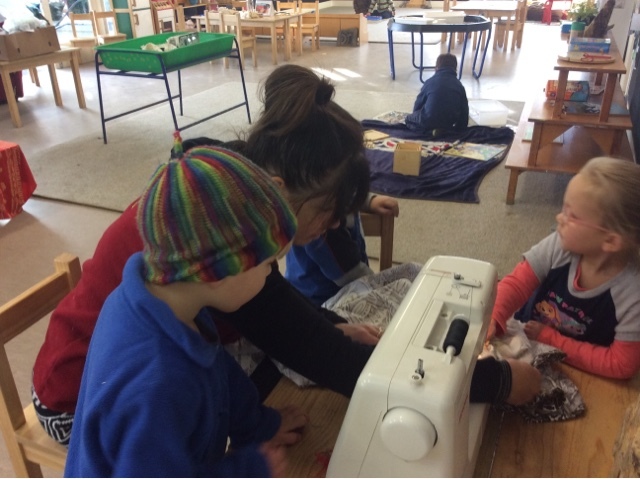 It was strange too because the children were actually taking a sewing machine to bits using all those wonderful tools like a screwdriver and spanner. 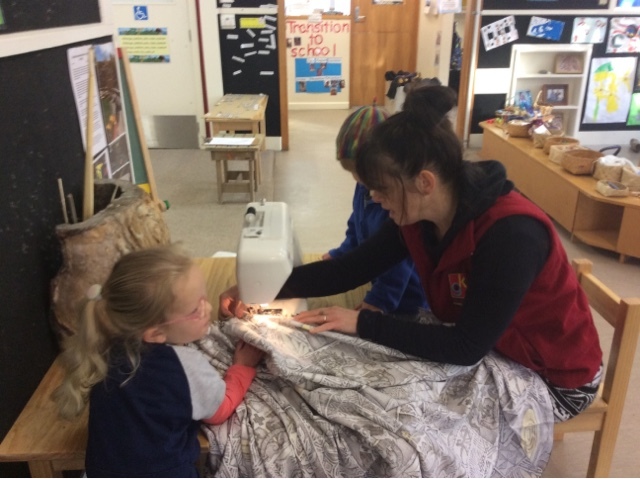 Sandra's sewing machine was going to be used for quite another purpose! Sandra gathered the pasifika material and set about to sew right around the edges we call hemming. Wintrow said, "I'm really good at this. I'm an expert!" Sandra chuckled probably wishing she was an expert too! We found out she was! 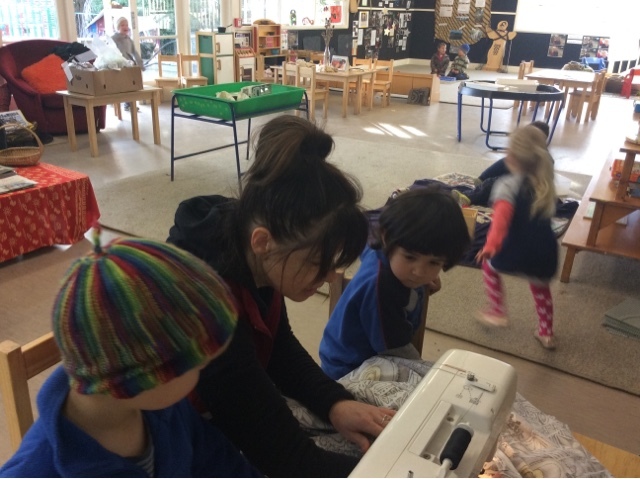 The sewing machine made a continuing whirring noise and Leo and Nikau were most interested and we could hear Sandra say, "Now, push the pedal with your foot!" And the whirring would start up again. They had to problem solve how much to push down and then lift their foot to stop. This was an amazing activity and showing the interdependency between teacher and child(ren).